Wicker furniture makes your outdoor living space look aesthetically stunning. However, according to Wicker Paradise, this furniture must be carefully maintained, to prevent it from wear and tear. The best way to care for Seagrass furniture is to keep it clean and dry. You can vacuum the furniture periodically with a brush attachment to remove dust and pollen. You can extend the life of your wicker furniture by preventing the formation of molds and mildew. Therefore, it is important to clean up spills and stains as quickly as possible. 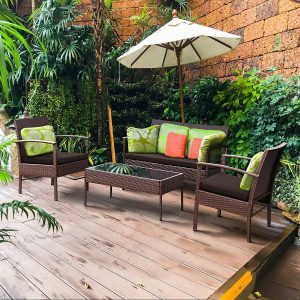 The wicker furniture must not be exposed to extreme weather conditions as it can become brittle in very cold weather and more elastic when it is very hot. This can lead to premature wear and formation of mildew. Wicker furniture must not be exposed to direct sunlight. Sunlight can damage natural wicker fibers and cause cracking of the paint. Resin wicker is also damaged by direct sunlight. In such cases, you can place your furniture in the shade. If your furniture is not protected by an overhead shelter, you can extend its life by covering it or moving it to a more protected spot during wet weather and when the temperature is very hot or very cold. These are the best ways of maintaining the wicker patio furniture. These steps not only provide easy maintenance but also ensure that the furniture lasts for a longer duration of time, while still maintaining its original look.